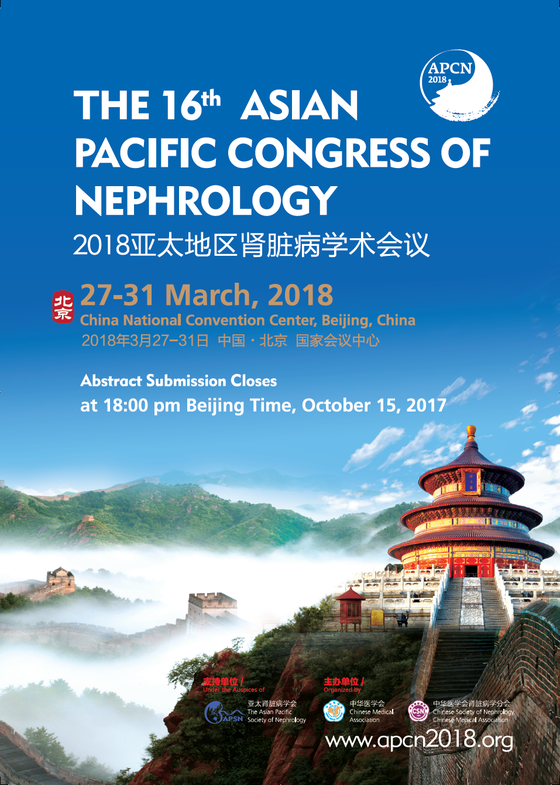 The 16th Asian Pacific Congress of Nephrology (APCN 2018) will take place on March 27-31, 2018 in conjunction with the 2018 Annual Congress of Chinese Society of Nephrology (CSN 2018) at the National Convention Center, Beijing, China. The Congress promises to offer an extensive scientific program, enabling the exchange of ideas and knowledge for facilitating research and clinical practice in nephrology. The abstract submission site (http://apcn2018.medmeeting.org/en) is now open. The deadline of abstract submission will be on 15 October 2017. On behalf of the Scientific Committee, we would be most grateful if you could help encouraging abstract submission from people working in the field of nephrology in your country, and assist in disseminating this message, as well as the enclosed flyer or brochure, to the members of your national society of nephrology.